A nymphalidae, perhaps a relative or member of Agraulis vanillae (Gulf Fritillary) roosts on Hilton Head Island, sheltered from the wind. Free swimming polychaetes (bristle worms) littered the surf at Tybee Island in April 2015. I guessed that they were depositing eggs. Jerry, one of my NAPIRE students from Pohnpei, Micronesia, is investigating pseudothelphusidae crab (Allacanthos pittieri) populations at the Las Cruces Biological Station this summer. His study has two major components: (1) measuring crab densities in areas that vary in the amount of leaf litter present (i.e., high and low leaf litter densities), and (2) assessing predation risk in high and low leaf litter areas (after Jenn Clark’s crayfish study; Clark et al. 2013 Hydrobiologia). Jerry hopes to demonstrated higher crab densities and lower predation risk in areas of high leaf litter because crabs are able to use the leaves as refuge and a source of food, both directly, as they are shredders, and indirectly by preying on other invertebrates in the leaf litter. Here, Jerry has tethered crabs using monofilament fishing line to flagging in about 20 stream pools. The crabs were paired in pools and restricted to either high leaf litter sections or low leaf litter sections of each pool site. The largest crayfish (at least, Orconectes obscurus) that I’ve ever encounter was probably about 48 mm in carapace length. This is an extremely common species at Jennings’ Woods, where much of the graduate work done in the Kershner lab is done, but it is native from the Genesee River watershed (where its type-specimen was collected) westward through northeastern Ohio, including the West Branch of the Mahoning River and Breakneck Creek (part of the Cuyahoga Riva watershed) where this big guy was found. I measured this specimen at 51 mm CL (which is about where the ruler is measuring – from the tip of the rostrum to the end of the carapace). I’m not quite sure, but the last record holder was caught drifting down a stream, completely legless. It was brought back to the lab, fed using forceps, cleaned regularly with a small sponge, and named Nubs. He lived about a month, until he began to molt, but was unable to complete the process and died. The crayfish, as I mentioned, was caught in Breakneck creek while I was assisting a Conservation Biology in the Field course a few weeks ago. The field location is owned, but little-used, by Kent State and includes some stunning forested wetlands. A shrimp with eggs in Costa Rica. Unfortunately I didn’t have a camera capable of video, otherwise I could demonstrate the bizarre, unidirectional movement of these juvenile snails that looked as if a 1×1-m carpet was moving over the benthos of the river. 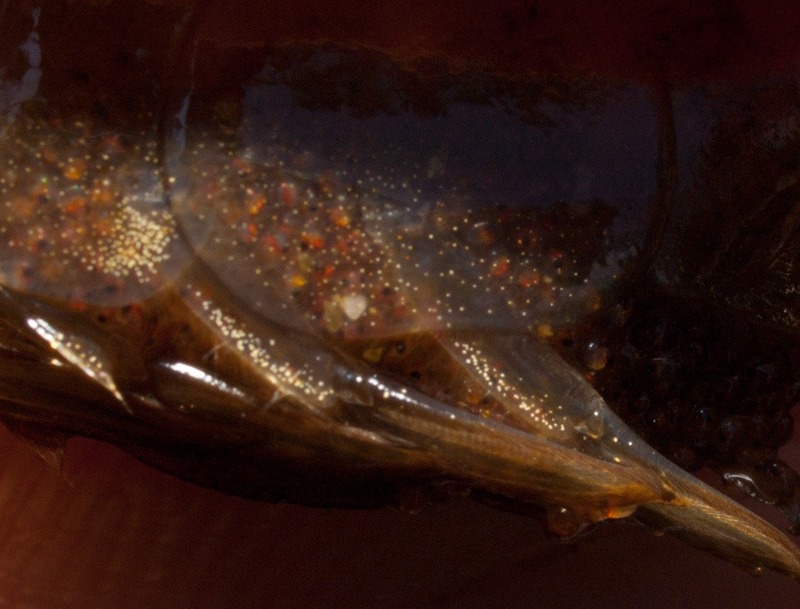 These glass shrimp (I can’t recall the species) are extremely common in Osa streams, as are the Neritid snails below. I had to take these photos from the surface, since I don’t have an underwater camera, but I think it would be extremely cool to see some underwater, macro-photography (like that over at Myrmecos) of macroinvertebrates. The diverse Piper genus (Piperaceae) is used as a model system for a variety of ecological studies, including work done by Dyer at La Selva on tritrophic interactions (i.e., plant [Piper] – caterpillar – parasitoid). It’s also economically important – we grind the dried fruit or seed to produce pepper. Here is a flower spike of a common species in Cahuita –I have no clue which – and a spider with stabilimentum that was often present with patches of Piper. The flies that are commonly seen on Echinodorus flowers are attracted to white objects and, perhaps, vegetation that’s been stirred up (well, the Syrphids certainly are – their increased abundance makes their buzz is loud in area’s I had recently walked through and disturbed within the wetland). Consequently, the flies are attracted to various white objects I’m carrying, and, occasionally one gets knocked down or otherwise temporarily incapacitated. The brief incapacitation resulted in two predation events picture here, both within less than 5 minutes. A group of ants and a large, surface dwelling spider prey upon flies.